SPECIAL DEAL -this deal won't last! Good until 2/28/2012! -then this page will be removed! Flaxseed is very economical at ~17 Cents/DAY an INCREDIBLE deal for inmeasurable health benefits! Premium Gold True Cold Milled Flaxseed is milled so NO HEAT enters the process, much like COLD Pressed Olive Oil. When the Flax seed is Cold Milled, the Omega 3 oil is not exposed to damaging heat and therefore remains unchanged from its seed form. Research is proving the many health benefits of Flaxseed!! Excellent way to replace fiber drinks + to add in protein drinks or other foods for daily fiber + protein! Eat 2-3 tablespoons flax seed daily. $20.00 Retail Special Discount SALE at $15.00! 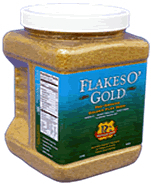 SPECIAL DEAL 6 Flakes o' Gold for $10.00 each =$60 total! SAVINGS of $30! Enter Quantity 1-5 for $15 each or Quantity 6 or more for $10 each (6 for $60) -Buy to stock up, give as gifts, or share with friends! Read about the health benefits of True Cold Milled Ground Flaxseed! Leave True Cold Milled Ground Flaxseed to go buy Quality Flax. Back to top of True Cold Milled Ground Flaxseed.